Today I have a couple of Spring cards I made with my Paper Smooches goodies:) Paper Smooches has just some of the cutest Spring animals that I couldn't resist doing up a couple of fresh cards! My first card mixes a bunch of PS sets including Spring Fling stamps, Clouds dies, Eco Friendly stamps, and Frame 1 die. I cut the clouds so that they fit together kind of like a puzzle and then die cut them again with the frame die. It's a fun way to get a different look with your dies:) That little chick stamp is one of my all time favorite Paper Smooches stamps! Seriously cute! 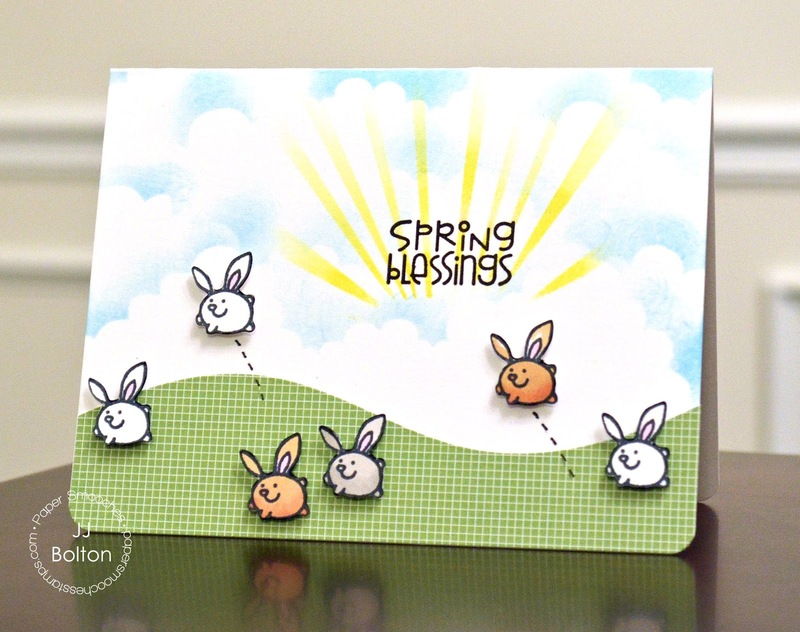 My next card uses a "Springy" stamps from the Squeaky Clean set. 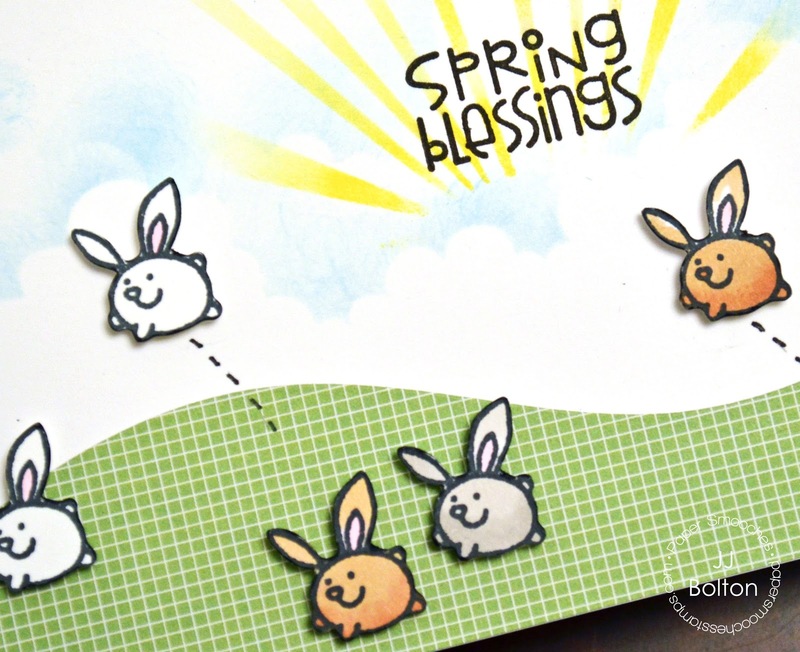 Um yeah, I used a dust bunny stamp to make a Spring card, heehee! As you can see, I fussy cut a bunch of them and had them springing all over the countryside:) I used one of the Border dies to cut the rolling hills and the sentiment is from Eco Friendly. Here's a closeup on those happy little bunnies! Thanks so much for stopping in today! I hope you have a wonderful week! Great cards! Love the jumping bunnies!! So cute! So much sweet in just one post--love! So cute! I love the die cutting on the first one, and those bunnies on the second just make me laugh. Can't wait for our next get together! Those dust bunnies are just too cute! I cannot love these enough! The awesome effect with the clouds on the first - I just did my first inlaid die technique this week & was ready to give up cardmaking forever, lol. Mad props, yo! And the dust bunnies...I envision them set free from homes all over during spring cleaning, allowing them to run free in the wild again. lol! both of these are so cute..
Love the inlaid clouds on your first card! That cute little chic is too adorable! And the dust bunnies card - Pure Genius!! Love them both! Oh, how adorable, JJ! I love how you played with the clouds and frame on your first card, and your dust bunnies are too CUTE! 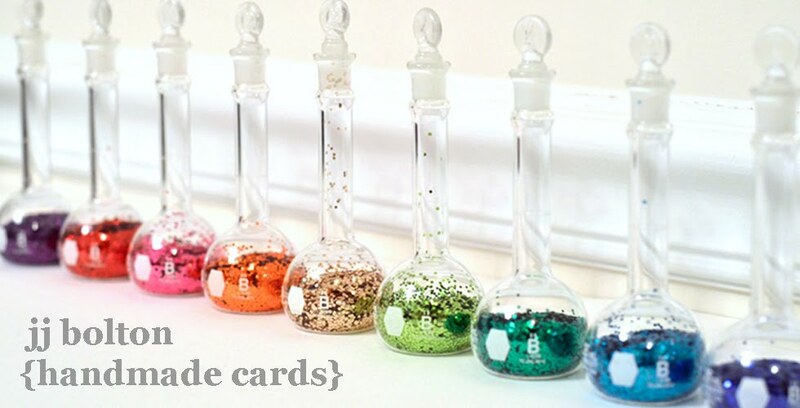 Really charming and clever cards!!! Ack, love these, JJ! Those leaping bunnies totally made me LOL! These are so adorable love the bunnies jumping around :) so fun!! VERY adorable spring cards...that chick is just too cute.